There is not much known about the history of Hitori. 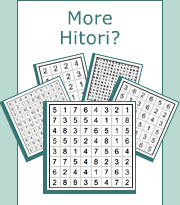 Hitori puzzles were invented in Japan by Nikoli Puzzles shortly after the debut of Sudoku and Kakuro. According to the article Hitori in Wikipedia, these puzzles made their first appearance in March 1990, in issue 29 of Nikoli’s Puzzle Communication magazine. Since then, Hitori puzzles have been appearing regularly in Nikoli Puzzle Times (パズル通信　二コリ pronounced Pazuru Tushin Nikoli), a quarterly magazine-book which was first published over 25 years ago. In addition there are three Hitori pocket books published since 1999, each containing 99 puzzles. Hitori, or ひとり in Japanese, means “alone”, or “by myself”. The full name as it appears in Nikoli’s books is ひとりにしてくれ, pronounced Hitori-ni-shite-kure which means "leave me alone". The Hitori brand name is registered by Nikoli Puzzles in Japan. In September 2006, Conceptis launched Hitori puzzles in 11 size configurations of 4x4, 5x5, 6x6, 7x7, 8x8, 9x9, 10x10, 12x12, 14x14, 16x16 and 18x18 and in seven difficulty levels starting from Ultra Easy and up to Very Hard. At the same time Sanoma Uitgevers (Netherlands) started publishing Conceptis Hitori puzzles in Hitori Light, a small format magazine which was first published three months earlier in June 2006. In October 2006 Sanoma Magazines (Finland) launched HiTORi, a 32 page 17x25 cm magazine containing 68 Conceptis Hitori puzzles with grid sizes from 4x4 to 14x14 and difficulty levels from very easy to very hard. In November 2006 Egmont Karnan (Sweden) published Hitori, a children's book dedicated to Conceptis Hitori and Sudoku puzzles for kids. Today, Hitori together with other logic puzzles by Conceptis are published regularly in over 35 countries including USA, Japan, the UK, Germany, Netherlands, Canada, France, Russia, Poland, Finland, Denmark, Israel, Hungary, Austria, Spain, Norway, Sweden, Greece, Switzerland, Belgium, Italy, Australia, New Zealand, Czech Republic, Brazil, Turkey, Korea, Thailand, Romania, Philippines, Estonia, Latvia, Peru and more.